The Cumberland & Dumfriesshire Farmers Mart P.L.C. 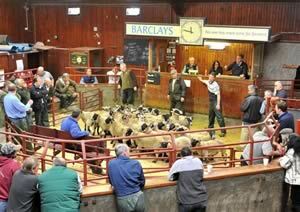 had forward 55 prime cattle, 1 young bulls, 68 over thirty month cattle, 4,664 prime lambs and 7,289 cast ewes & rams at their weekly sale at Longtown on Thursday 28th October, 2010. The prime cattle had more inside fed cattle on offer, which saw a brisk trade throughout. Top price was 176.5p for a Limousin heifer from Messrs Ritson, Swaites and purchased by W Kirkup & Sons, Butchers, Longtown, 173.5p Hallburn, 169.5p Toppin Castle & Hallburn, 167.5p, 162.5p Hallburn; Blondes 169.5p Toppin Castle; Charolais 164.5p Upper Mains, 163.5p Hallburn & Sceughdyke. Limousin bullocks to 171.5p (£1191.93) from N Forster, Haining House and purchased by W Kirkup, Butcher, Longtown, others to 157.5p Haining House; Charolais 166.5p Fenton, 162.5p Sceughdyke, 161.5p Fenton, 158.5p Sceughdyke. Top prices per head Charolais heifers £1143.28, £1037 Upper Mains, £1030.05 Hallburn. Charolais bullocks £1170.88 Fenton, £1135.58 , £1125.35 Sceughdyke; Simmental £1106.08 Sceughdyke; Limousin £1191.93, £1165.50 Haining House. A much larger show of 71 OTM forward which met a fast trade throughout for a good show of feeding cows. Top price to 136.5p for a Simmental cow from TF Siddle Mosside and OTM bullocks to 135.5p also from Mosside. Friesians 95.5p Highmoorhead, 85.5p Brisco Hill; Charolais 93.5p, 91.5p Burnside; Limousin 106.5p, 103.5p Greystoke Castle, 97.5p Wanwood Hill, 94.5p Greystoke Castle, Galloway 84.5p Peela Hill; British Blue 109.5p Ladyhousesteads, 96.5p Cadgillhead. Top price per head Limousin steer £867.20 Mosside; Friesian cows £666.90 Brisco Hill; Charolais £790.08 Burnside; Simmental £907.73 Mosside; Limousin £788.10 Greystoke Castle; British Blue £799.35 Ladyhousesteads; Angus £701.10 Ladyhousesteads; Devon £706.45 Greystoke Castle. A smaller show of lambs was forward to a full ring of buyers with the trade being 10p dearer on the week. Good export weight lambs were short of requirements with too many lambs over 46kg forward. Top was £95 for Texels from Woodhead and to 207p/kg for Beltex from Sorbie. Suffolks £94.50 Woodhead, £77.80 Sceughdyke & High Wreay, £76.80 Tinnis Hall; Cheviot £70.50 Blackburn, £67.80, £66.80 Raeburnfoot; Texel £94.50 Woodhead, £90.50 Little Burtholme, £87.50 Byreburnside; Charollais £79.80 Barrockend, £79.50, £76.80 Nunscleugh; Greyface £75 Gibbs Hill, £72.50 Henrys Hill, £71.20 Nunscleugh; Cheviot Mules £68.20 North House; Leicesters £64.80 Allensgreen, £59.80 Peela Hill, Blackface £67.80 Albierigg, £66.20 Allensgreen, £64.50 Catslackburn; North Country Cheviot £73.80 Haymont, £72 Coldside, £67.20 Adderston Shiels; Swaledale £60.80 Kilnstown; Jacob £53.50 Bonnyrigg Hall; Beltex £84.80 Sorbie, £74.80 Westhouse, £72.80 Sorbie; Zwartbles £65 Crofthead; Romney Marsh £54.80 Churchview. Lightweight lambs to £65.80 for Texels from Brantwood, £62.80 Newington & Low Eals; Suffolks £62.80 Beachmenach, £60.80 Coshogle; Cheviot £59.20 Cross House, £57.80 Raeburnfoot; Greyface £60.20 Upper Hindhope, £58.20 Low Eals; Blackface £60.80 Syart, £57.80 Westloch; Swaledale £48.20 Lilswood Cottage; Herdwick £55.80 Newington; Jacob £44.20 Bonnyrigg Hall; Beltex £64.80 Maidencoates. A monster show of cast ewes and rams were forward to the usual ring of buyers and trade was similar on the week with all classes easy to sell. Top was £122.50 for Texel ewes from Hazel Head and Texel rams from Trough Head. Other Texel ewes £116.50 Easthouse, £113.50 Westhouse; Suffolks £120.50 Easthouse; £94.50 Brantwood; Charollais £102.50 Coltside; Halfbred £86.50 Waterhouse, £84.50 Ruletownhead; Greyface £113.50 Gateside, £86.50 Bluegate; Cheviot Mules £91.50 Poolside, £84.50 Graygate, £77.50 Langon Lees; Leicester £94.50 Hartside, £90.50 Bluegate, £80.50 Laverhay & Hartside; North Country Cheviot £96.50 Waterside, £89.50 Tirrilend, £82.50 Westhouse; Beltex £78.50, £74.50 Hartside; Romney Marsh £64.50 Kirkland Green. Light ewes to £67.50 for Blackfaces from Brownleazes, £66.50 Lanarkfoot, £64.50 Pitland Hills; Swaledale £56.50 Lanarkfoot, £47.50 Brantwood, £45.50 Stonehall; Herdwick £34.50 Brantwood; Cheviot £66.50 Stackbrae; £65.50 Daltongate, £64.50 Easthouse, £62.50 Raeburnfoot. Other Texel rams to £110.50 Poolside, £109.50 Byreburnside; Suffolk £110.50 Harwood House & Watergate; Cheviot £100.50 Blackhaugh, £84.50 Arkleton; North Country Cheviot £112.50 Riggshield, £98.50 Forss, £84.50 Midtown; Swaledale £49.50 Brantwood; Beltex £84.50 Easthouse, £69.50 Winterhope; LLynn £112.50, £82.50 Westhouse; Easycare £72.50 Brantwood.